The bleakest of Bresson's meditations on misery, MOUCHETTE feels every bit the logical extension of his previous AU HASARD BALTHAZAR, but here with specific focus on the realm of human suffering. 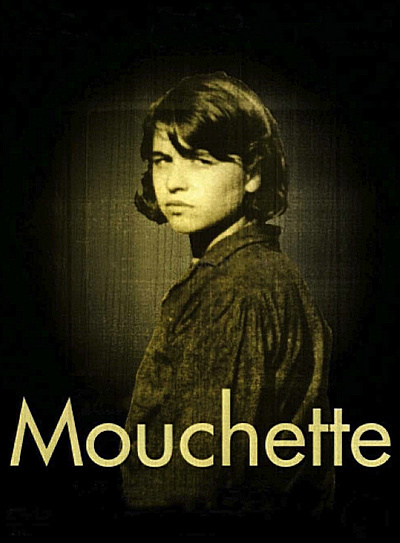 Abused and overburdened at home, ridiculed at school by classmates and teachers alike, the life of country schoolgirl Mouchette is presented on no uncertain terms; the world for her is a living hell. In the title role, Nadine Nortier is the apotheosis of Bresson's actor/model doctrine. Her one-off performance is heartbreaking, but also honest and raw, stripped of artifice to a degree rarely seen in child actors. Her finest moment lies in the joyful release of the carnival scene, where an oppressive world takes a backseat to bumper cars and a boy, and from under her downtrodden facade emerges genuine warmth. But with the arrival of her alcoholic father, this exuberant reprieve is cut unceremoniously short, and Mouchette slides back into her role as supreme pariah of 60s cinema. Bresson had always possessed a fascination with the human spirit under desperate times (he had, after all, spent a year in a POW camp during World War II), but by 1967, this was coupled with an underlying cynicism present in the 65-year-old director's films. That cloud hangs over MOUCHETTE right up through the cold and uncompromising final scene, a testament to the devastating punch minimalism can pack, and an all-around unshakable slice of filmmaking. • Audio commentary by renowned film scholar, critic, and festival programmer Tony Rayns. Rayns provides an inside look into Bresson's cinematic style as he dissects each sot and scene presenting the film in a more accessible manner for newcomers to Bresson's work. He compares Bresson's style to conventional cinema and what make's his work stand out among the other French filmmakers of that era.